So yesterday the press (and Action on Heairng Loss) published a story which has - yet again - brought the Deaf community together in what has mainly been shock and sadness. The BBC news story Deaf Gerbils hear again after stem cell "cure" has sparked interesting, if a little outraged, debate on social media. 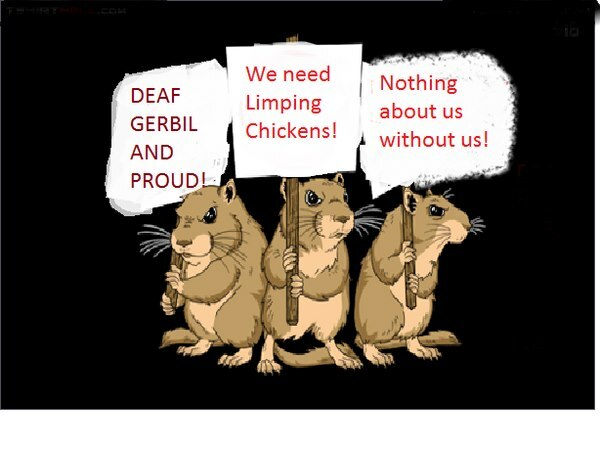 The story claimed that over 10 weeks of being injected with stem cells and such like the Deaf Gerbils could hear on average 45% better than before. And as the story reports "It would mean going from being so deaf that you wouldn't be able to hear a lorry or truck in the street to the point where you would be able to hear a conversation. It is not a complete cure, they will not be able to hear a whisper, but they would certainly be able to maintain a conversation in a room." Because I was interested in the story I posted it around Facebook. On my own page I got the kind of predictable "Oh my Gods" and the normal arguments against a "cure" for deafness from my deaf friends. And the normal misunderstanding from my hearing friends who couldnt work out why anybody wouldnt want to hear. It was when I posted the story on the NDCS facebook page that I was a little shocked.. Straight away I had a comment telling me that the research was amazing... and the overall opinion did seem to be that deaf children were part of a hearing rather than deaf community... and that they didnt have much of a deaf identity. I did think it would be interesting to know how many of these children also had cochlear implants? I do have to stress though that I know several "NDCS Mums" who would never dream of "curing" their childs deafness and are proud of their deaf child and what they achieve. The twitter debate #DeafGerbils has been predictable really... The people I know are mainly members of the Deaf Community in a big way and there have been some funny comments and cartoons - including the picture below. I did have an interesting discussion with one person about the similarities between the arguments about stem cell "cure" and cochlear implants. We agreed that actually the pressure put on families by ENT consultants, audiologists, ToDs etc has a massive impact on the choices parents make. We already know that some audiologists and consultants are openly still preaching against BSL use which I think is unforgivable. From what I've understood - which is limited by my scientific knowledge - if someone did gain funding etc to continue this research it would be many years before it was successful enough to even be trialled on humans. Thats great because it gives us plenty of time to campaign against it and show people the reasons why deaf people love being deaf! As someone told me earlier, there needs to be a greater focus on raising deaf awareness so that when a deaf child is born to a hearing family they have some basic knowledge of deafness. Anyway - If you want a particularly interesting film to watch about the -dangers- of a "cure for deafness" I totally recommend watching the film The End, by Ted Evans. Its a remarkable piece and made me cry when I watched it - I think it sums up the fears of the Deaf community perfectly. I dunno - maybe this will save people from a lifetime of wearing and maintaining hearing aids. I know a few deaf people who dont want to be deaf - as long as this isn't forced on anyone - I see no reason to oppose it.